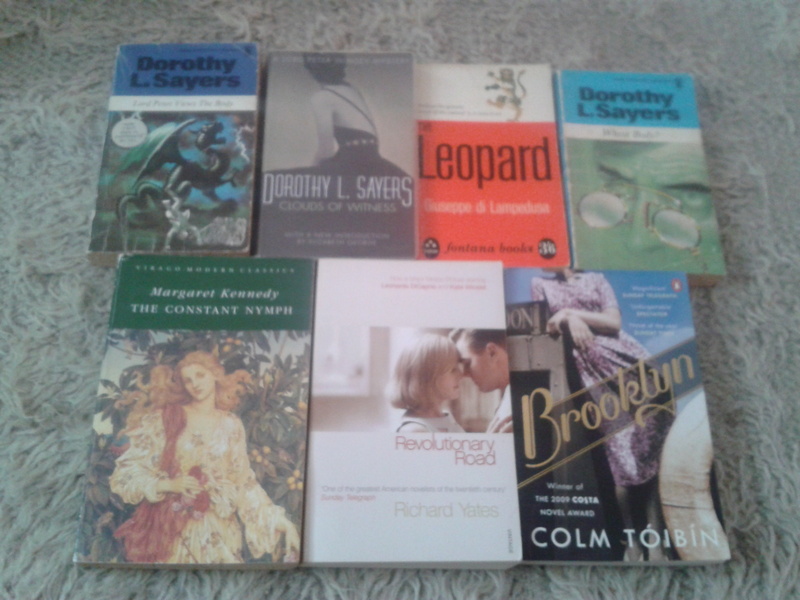 I’m currently on the lookout for novels by mystery writers to inspire some of my literary knits, so I was really pleased with my latest book haul from the Oxfam bookshop in Haverfordwest. I just love those covers of the Dorothy L. Sayers books, they’re fabulously retro! ‘The Leopard’ by Giusepe di Lampedusa keeps cropping up on recommended reading lists, but I’ve never come across it either new or secondhand, so that was a lucky find. Also, the day before, my friend Helen was simply raving about Margaret Kennedy’s ‘The Constant Nymph’. I’ve never heard of the book or the author before, so I was thrilled to find it the very next day. I bet Helen will be horrified that I’ve described her as raving, she’s far to elegant to rave, but then she did eat nearly half of the After Eights, so I refuse to show any mercy. ← Book 7 – In which Odysseus needs to get up off the bloody floor! Fabulous finds! Sayers is just amazing, and I’m a recent convert to The Leopard – a great book! I’ve just started ‘Clouds of Witness’ and it’s wonderful! I’ve been asked to knit a Dorothy L. Sayers, along with a few other mystery writers and characters and I feel I need to read them first to know who I’m creating, but it’s going to be an absolute pleasure! 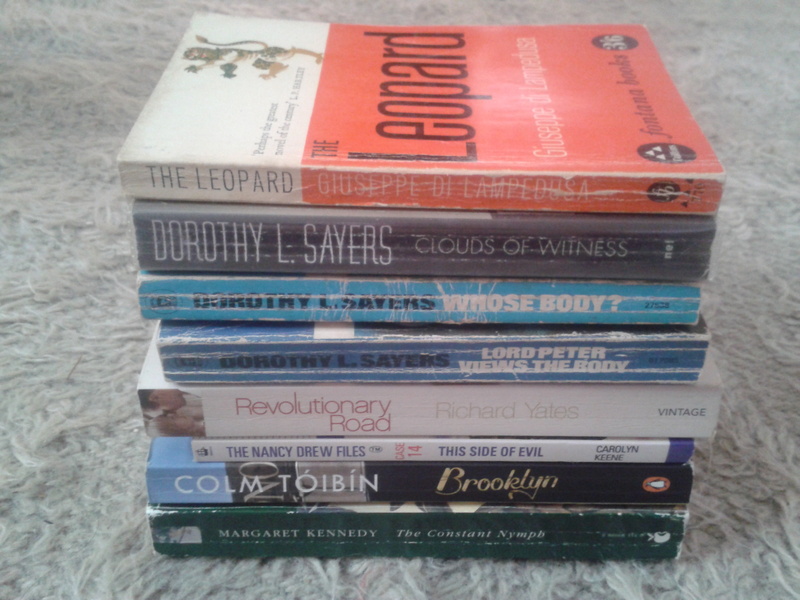 ‘The Leopard’ will have to wait for now until I’ve finished my mysteries – there just aren’t enough hours in the day! Yay! Look forward to seeing the knitted Sayers – will you do a Lord Peter too? Half the After Eights, that’s called scandal where I come from. I was shocked Ste, but I did my best to avert my attention from the snaffling noises and the multitude of black squares wafting slowly to the floor like dark snowflakes around her feet. Several of my Sayers copies are the New English Library editions – you’re right, they are fabulously retro! Just looking at the covers makes me sit up a bit straighter and talk with a slightly more clipped accent. I can definitely feel a Sayers season coming on! What wonderful finds. I can only echo the praise for Dorothy L Sayers, and add that I love Margaret Kennedy and am delighted to hear of another reader raving about her work. I hope that you’ll feel the same way. I’m really enjoying the Sayers – this will be the first of many! The Kennedy was such a find. I couldn’t believe it was the same book I’d heard so much about only the day before – I actually texted Helen to check. So that’s two hearty recommendations – I must crack on with it! My mother quite fancies Sayers and Ellis Peters. She believes too many detective/mysteries get bogged down in gruesomeness. Me, I just want to be able to sleep at night after reading. As for the After Eights… does she dip in the box or are the chocolates demurely cloaked in black upon the tray? Best to keep them out of her sight, methinks. They were in the box, Andrew. I’ve never understood why anyone would take them out of the box in the first place. Surely the correct procedure is to remove the After Eight from the box leaving it’s papery shell intact so the box looks untouched despite there being only three left? Maybe that was just how me and my brother ensured unlimited access to illicit Sunday chocolate. We never got caught. I think my parents thought it was my Nan so they never mentioned it! It was FOUR after eights. FOUR I tell you. The only reason that qualified as “half a box” is that either Sarah was thinking of those tragic mini boxes, or someone else had already scoffed most of the box, thus leaving only eight. I don’t even read mysteries, but I adore Lord Peter Wimsey (and Parker, of course). The Constant Nymph sounds like a winner. Looking forward to seeing those knits!